Tag line: "A famous American play, in an infamous American town"
Our Town, a play written by Thornton Wilder in 1938, is set in the early 20th century in the small village of Grover’s Corners, New Hampshire. As the Narrator says, nobody spectacular ever came from Grover’s Corners, at least as far as anyone knows. The characters who populate this fictitious town lead small-town lives, and have names like Wally, George, Emily, and Howie. Compton, a community in Los Angeles County, California, is known for its poverty and the occasional drive-by shooting. The people who live in Compton have accepted danger and hardship as part of their everyday lives, and have names like Ebony, Jose, and Armia. Miguel Dominguez High School, located in Compton, is a reflection of the town. The walls are covered with graffiti, and the students complain that race riots, between Blacks and Hispanics, are as much a part of their school as Homecoming or Graduation. 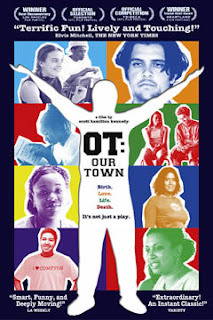 OT: Our Town, a documentary by Scott Hamilton Kennedy, tells the story of two teachers and 24 students at Dominguez High, who, with no money (and not even a theater), plan to put on a production of Our Town, the first play to be performed at their school in nearly 20 years. The film opens one month and 13 days before opening night. Catherine Borek, the teacher behind the project, is busy selecting a cast, and by the time she’s done, she has who she believes will be the best person for each part. There’s Ebony, aged 16, who'll play the Stage Manager, essentially the narrator of the story. Archy, 16, and Armia, 17, will be the young lovers George and Emily. Jackie, an aspiring actress and fan of N’Sync, will be town gossip Mrs. Soames, and Jose is chosen to be Simon Stimson, Grover’s Corners choirmaster and town drunk (while I can’t say for sure, I believe it's probably the first time Simon Stimson will have been played by someone with a stud in their tongue). There's a lot to like about Scott Hamilton Kennedy OT: Our Town. For one, this is a true story, captured as it was happening, with no preconceptions on how it would end. At the film’s outset, through interviews, observations, and even tagging along with the students outside of school, I was convinced Our Town would never see the light of day. In contrast to the many Hollywood fabrications on this theme, where a fairy-tale ending has you believing “No mountain is too high”, there were complications involved with OT: Our Town that were the equivalent of scaling Mt. Everest. Even up to the moment of the final rehearsal, I didn’t know what to expect, and the film never led me one way or another. It just followed along. Second, the realities of these kid’s lives outside school made their participation in the play all the more amazing. Director Kennedy took his camera everywhere, and in so doing reveals a great deal about his subjects. Ebony is being raised by a woman who was her babysitter. At five months old, her real mother, a prostitute, dropped her off and never returned to pick her up. Jose has attempted suicide, and though he failed, he tells of a friend who successfully ended his own life. At one point, the film crew is conducting an interview with several students in the parking lot when shots ring out. A car speeds by, and you know something very bad has just happened. This is the reality these kids must face on a daily basis. To try and remove yourself from these situations is difficult enough, but to do so by playing characters from long ago, with dialogue that may sound hollow and unconvincing to a modern audience, is something else altogether. What took place at Dominguez High in that one month and 13 days was more than a transformation; it was an awakening for many (if not all) of those 24 students. And what is the legacy of this small school production of Our Town? Well, for two years after the play was performed, there wasn’t a single riot at Dominguez High.